Various work and family commitments kept me at home in the evenings this weekend but I managed to sneak out on Sunday morning for another look for badger setts. 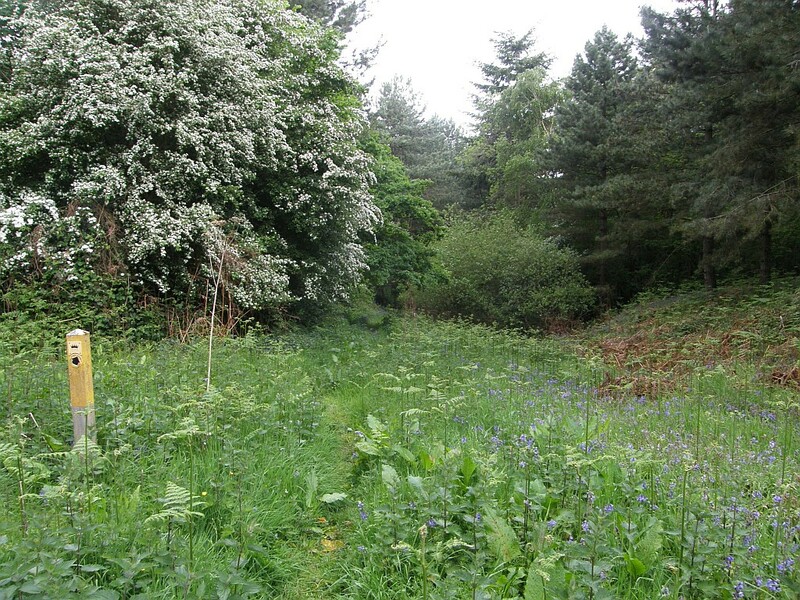 I didn’t find what I was looking for but I did explore the far side of the woods and add a couple of new setts to my map of the area into the bargain. I may have mentioned that the woods are on the top of a hill – not a huge hill, but big enough for this part of Bedfordshire. Odd as it may sound, almost all of my attention to date has been on the side of the hill nearest our village, so it was time I paid a visit to the other side. 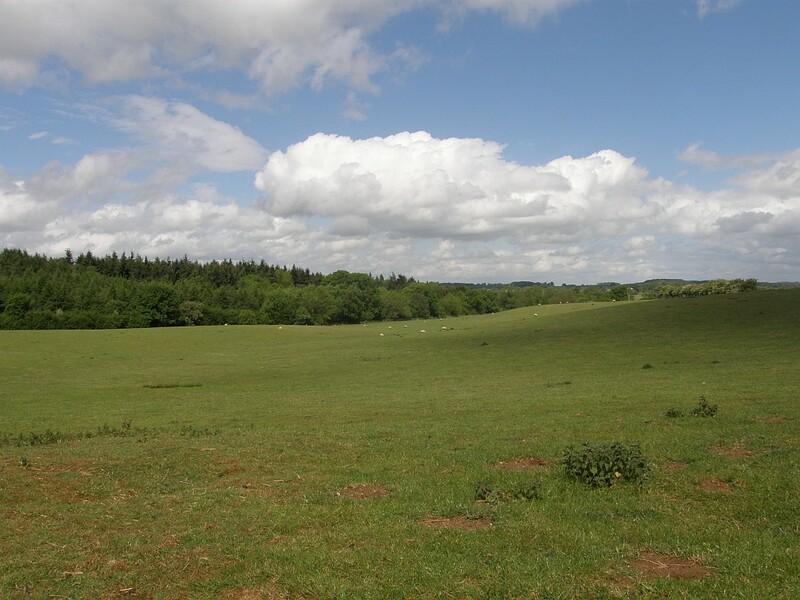 The woods are a mixture of conifers and deciduous trees, surrounded by pasture. It’s ideal badger country. I was looking for the sett that bordered the main sett on the east side. I thought this was the Beech Tree sett but I’m not sure now. It doesn’t seem to be active. I didn’t find any sign of a sett in this area, but I find a couple of new setts further to the east. 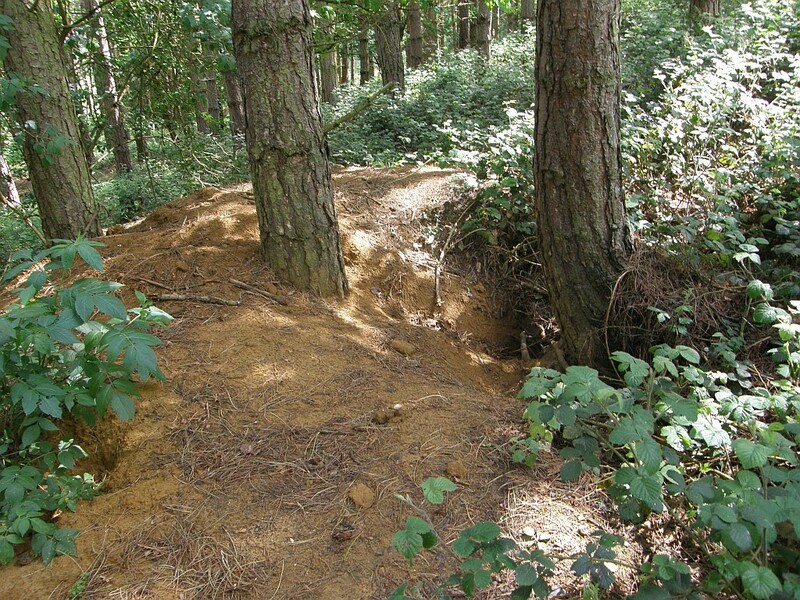 Here’s what looked to be an old and established sett on quite a steep slope. 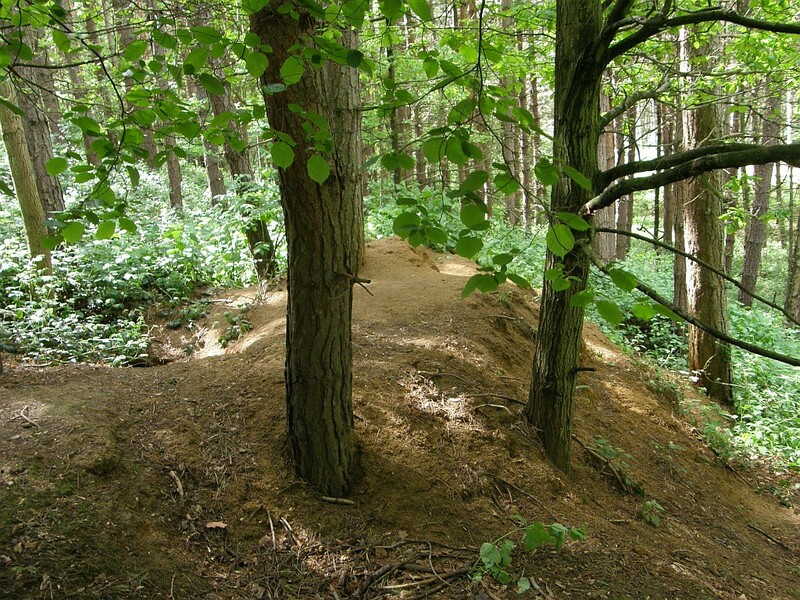 The spoil heaps in the sandy soil are huge. The badgers must have worked for generations to alter the landscape like this. It rained heavily early on Sunday morning so there were no tracks visible, but the sheer size of the excavation could only mean badgers. 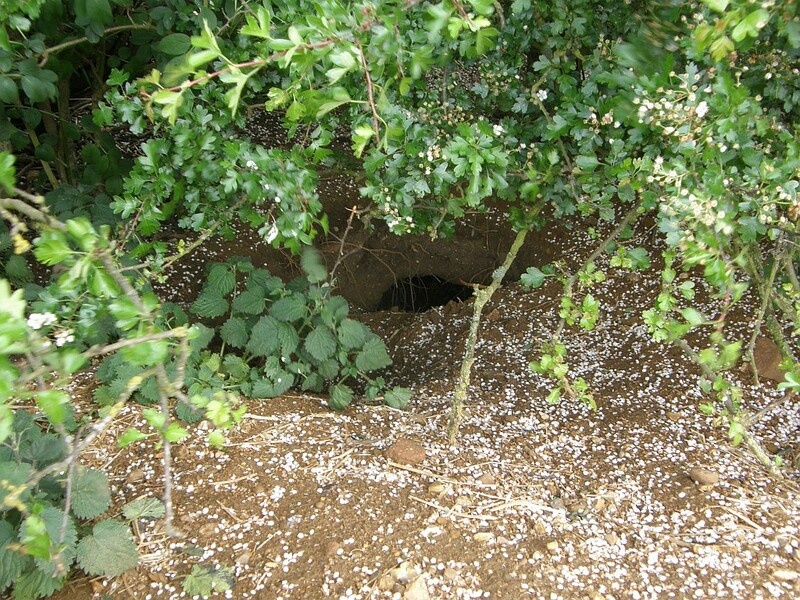 There were a number of holes linked by obvious paths, so this seems to be an active sett. Here’s another sett. This one was outside the wood in a hedgerow that was only one hawthorn tree wide. I’ve seen hedgerow setts like this before. It shows how badgers can adapt to most places. There were two main holes, the spoil from which had spilled through the fence and been worn away by the sheep in the field. 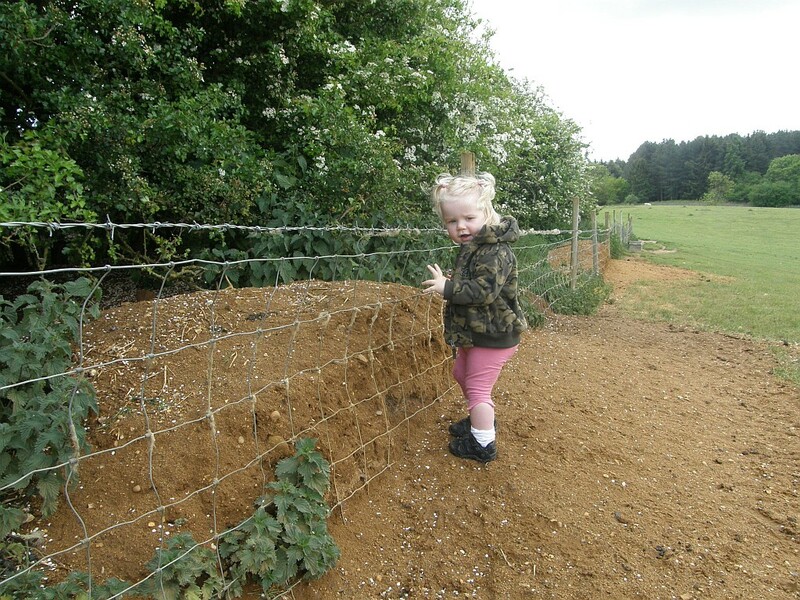 My young assistant here shows the scale. The holes were visible in the bushes. Again, there were no tracks, but the shape of the hole, the size of the spoil heaps and the discarded bedding all point to badgers. So I’ve got a few more coloured dots on my badger map, even thought there’s still some significant blank spaces. But all in all it was an enjoyable walk, even if it was almost into the next parish. Its great to read your updates. I’ve found a few setts in hedgerows and its amazing how well they adapt. One I know of is in a hedgerow along a lane and one of the entrances comes right out onto the lane. At first this really worried me what with how fast people drive along lanes these days, but then I though that could be one of the safest places for them as they will be able to feel the vibrations of any traffic coming and be alerted to it. I’ve not seen any badgers from that sett yet although I did see 3 hares last weekend near to it and unfortunately one that had been killed by a car, but it did allow for positive ID that they were actually hares! Last night I had my most successful badger watch to date! I got to the sett I normally watch at 7.45pm and I’d been sat down for barely 5 minutes when 2 badgers emerged. I had my camcorder and camera with me and got 40 minutes of footage until my battery died. 5 badgers in total came out and stayed out for an hour and a half before dispersing. 2-3 were quite small so maybe last years cubs. One was tiny, not even a foot long I think so must be this years cub! They knew I was there but weren’t bothered by me. I put down peanuts and some rat food and they came within a meter from me! Got some amazing photos and they didn’t mind the flash. Sounds like you’ve been having some great experiences, especially with the cub and the long session. It’s great that you’re able to get so close to the badgers too. Are we going to see the video online anywhere? I have put some photos and one video online but my internet is not very fast and some of the footage is on my camcorder which I need to transfer onto my dad’s windows xp pc. I will get round to it!! Been spending a lot of time at the sett and there are 5 cubs and seen at least 4 others. They come very close, within a meter from me. I took my other half to see them last week and they still came very close. I have had some people ask if I should be letting badgers get used to people. What are your thoughts on this? My other half has 2 sons and his eldest who is 9 would like to watch the badgers some time, do you think its possible they would still come out if he could be quiet enough? I know its tough for kids sometimes to stay still!! Excellent pictures! And real close-ups too. Very nice indeed. And you’re right, one of the things that makes badgers interesting (more interesting than other mammals, in my opinion) is their social behaviour. Seeing them playing and interacting together is a real treat. As to the badgers getting used to people, I wouldn’t worry. I’m guessing they’re coming close to you because you’re careful and you’re quiet and still. I can’t imagine that they’d wander up to the average person. Yes, there are people who want to do badgers harm, but unless you’re actually making them tame they should retain their natural caution. As to the boys, I’d say yes. True, they may get bored or frustrated or whatever, but creeping round woods in the dark is great fun. I mean, I’m on the wrong side of 40 now and I still love it. Make a game out of keeping quiet and stealthy, keep the visit short, and see how it goes.